Miss Adeline Hayes is the perfect lady's companion: pleasant, conversational, and unceasingly proper. But when her closest friend, Charity Edgeworth, breaks off her arranged marriage without explanation, even Adeline's superior skills are put to the test. Charity's father banishes the two young women to the country, sending Adeline with a charge to find Charity a husband or suffer dire consequences. 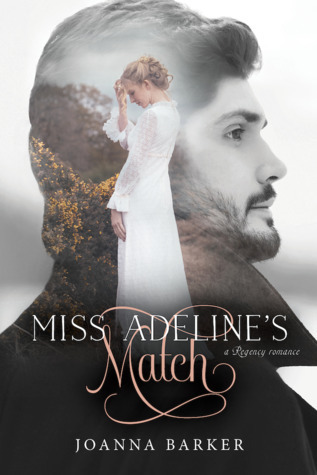 As Adeline takes on the role of reluctant matchmaker, she discovers more than one obstacle in her path. Not only does Charity prefer escaping in books to socializing, but Adeline soon finds her own attentions distracted by the standoffish—and irritatingly handsome—Mr. Evan Whitfield. Amidst an eventful foxhunt and the unexpected arrival of Charity's former betrothed, Adeline simply doesn't have time for a battle of wits with Evan. But the two are continually drawn together until Adeline begins to question her tightly guarded convictions about love and marriage. However, when secrets are revealed and truths made known, Adeline must face her most fearsome obstacle yet: herself. Such a moody vibe in this Regency romance, and I think much of it has to do with the winter setting! I felt transported and could practically feel the chill of the snow and wind. Adeline is an interesting character, unlike any lady's companion I've read in other stories- she is better at navigating Society than her charge/friend, Charity, and has a confidence that doesn't reflect her lower standing. I appreciated her witty retorts to the gossipy ladies who made Charity uncomfortable with their remarks. She also knew when it was prudent to rein herself or Charity in. She has a flaw of becoming manipulative, justifying that she's doing it because she sincerely wants what's best for Charity... but there are some personal motivations influencing her as well and her social juggling is bound to come crashing down. She and Evan (love that name) don't have the best first impression of one another, which makes it all the better as they get to know and fall in love with each other. I truly enjoyed seeing Evan's personality open up from a dour Mr. Darcy to an enchanted Mr. Knightley. There is plenty of emotion and angst as heartbreak, loyalty, secrets, and rejection play a role in each character coming to a place of understanding and forgiveness. Loved it and looking forward to more from this author!